On August 28, 2018, the briefing devoted to «Amul-Khazar 2018» international rally was organized at the MFA of Turkmenistan. The representatives of accredited diplomatic missions, international organizations, national and foreign media participated in the event. 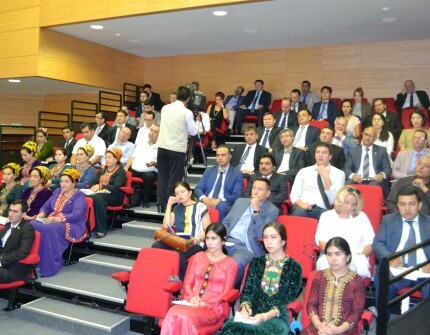 Senior officials from the Ministry of Interior affairs, the Ministry of Sport and youth policy of Turkmenistan and the chief editor of «Türkmen dünýäsi» delivered speech for participants. Participants got familiarized with the preparation works and qualification sessions for «Amul-Khazar 2018» international rally race. It was clearly noted that, this international race is not only the sports event but it evidences Turkmenistan’s commitment to policy of developing transit, transport corridors and multimodal routes. The President Gurbanguly Berdimuhamedov’s initiative to organize such race and practical implementation of organizational and other related issues under his leadership demonstrate significance attached to this large motor sport project. In addition to that, the role of mass media in covering rally race is stated. The winners of Dakar, Africa Eco Race and Silk Way rally races and other popular racers are expected to participate in this international rally. The foreign media representatives and diplomats were not only provided with detailed information on «Amul-Khazar 2018» international rally, they also had time for question-and-answer.